Following the disappointment of England not reaching the quarter finals and the bombardment of press and social media articles about what went wrong, who is to blame and what should be done about it, I have preferred to look at how this tournament will affect the game in clubs around the country. The first objective looks like being met and surpassed. The games have been absorbing with the astounding Japanese victory over South Africa set to be the highlight not just of this tournament, but over the history of the Rugby World Cup. But nearly every match has seen the less fancied team put up a fight and Georgia’s win over Tonga and Romania overcoming Canada after being 15-0 down have kept me glued to the TV. There was some discussion back in August that there would be empty seats at some of the matches (see RWC Ticket Prices) but attendances at all games have been sell outs or near sell outs. I’ve already mentioned the dramatic game between Canada and Romania but I think that this was probably the most difficult of games to sell tickets for. It was on a Tuesday with a 4:45pm kick off between two Tier Two nations and it was in Leicester, where the traditional rugby supporter was pretty miffed at Welford Road being overlooked as a match venue. 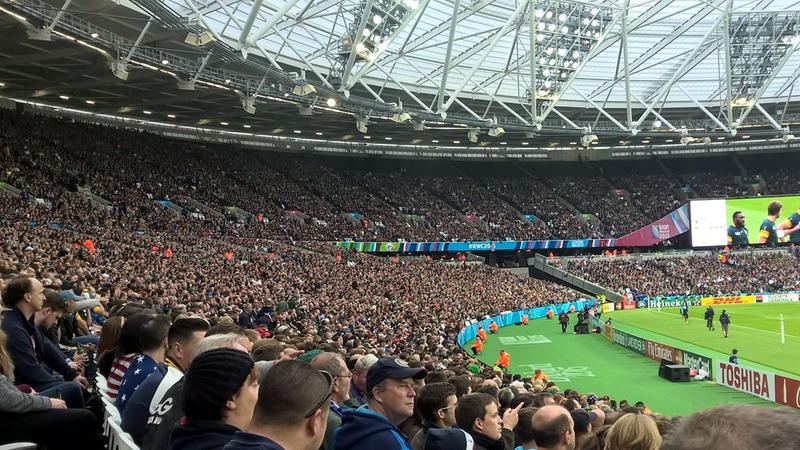 However, over 27,000 went to watch the game at the 32,000 capacity Leicester City Stadium and despite the rain they saw one of the best matches so far with Romania winning 17-15 with a penalty three minutes from time. As for the second objective, clearly this has not been met. The Pool of Death was aptly named and it was the England team that perished while Australia and Wales survived. The RFU will have a review after the tournament is over so there is not much more to be said until then. I have to feel sorry for Uruguay who were drawn in a pool with four nations in the top ten in the world; in any other pool they would have surely been in with a chance of winning a game or two. The third objective has already been partly achieved. On Wednesday I went to the Olympic Stadium for South Africa v USA, a match that on paper was going to be very one-sided and sure enough the Springboks score ten unanswered tries, but once again all 54,0000 seats were sold despite the late afternoon kick off and the atmosphere was great. There were lots of families and people who had never been to an international rugby match before, enjoying the more relaxed rules than those imposed at football games with supporters all mingling in the stadium and enjoying a few drinks, alcoholic or otherwise. This has been repeated in stadiums and fanzones all over the country but we will have to wait to see if this will have a positive impact on spectator numbers at Premiership games or at lower level rugby clubs. The RFU has already spent over £10m in improving grass roots clubs in anticipation of a surge in interest in the game so you could argue that a substantial lasting legacy has already been achieved in the form of upgraded clubhouses, changing rooms, pitches and floodlights Over 2000 new coaches and referees have been through courses and potentially there are thousands of new volunteers who are currently part of The Pack and who will be invited to get involved with their local rugby club. And this is where England’s failure to get out of the pool stage may cost rugby union dear. An extended run for the national side in the World Cup was to be a catalyst for children to come to rugby clubs on a Sunday morning and for adults to either return to playing after a break from the game or take it up for the first time. 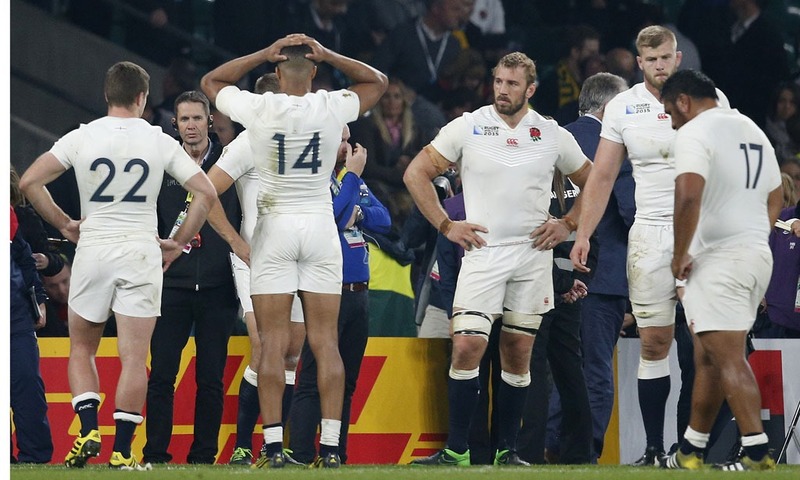 Will this ambition now be thwarted now the wheels have come off England’s Sweet Chariot? We have to hope that potential players will be inspired by the competition rather than the success of any participating team. The Core Values of Rugby Union that underpin the game have been amply demonstrated by winners and losers alike. South Africans applauding Japanese after their shock win, England’s dignified reaction after losing to Australia, the behaviour of the crowds at all the venues; all examples of respect and sportsmanship that could encourage people to get involved with the sport. There is still a lot of rugby to be played with two hugely important games this weekend with France v Ireland and Wales v Australia to decide who will top their respective pools and theoretically secure an easier path to the final. Then we get into the knockout stages which I am sure will provide their own drama; it’s just a shame that England won’t be a part of it. The spirit of lots of ‘non-rugby’ fans has blown me away – I’ve seen such enthusiasm to get involved and understand our great game (even my usually disinterested mum has attended and loved 3 games so far!). Sadly, this week I’ve also seen lots of self-confessed rugby obsessives turn their backs completely now that England are out. I am still shouting loud about how amazing our sport is, as a member of the Pack and as a longterm community club volunteer and coach. It’s been a truly wonderful experience so far and the next few weeks will be amazing. Love your blog. Thanks for your feedback and I hope you are enjoying the experience of being part of The Pack. Are you already involved with a rugby club and if not, has RWC inspired to maybe get in touch? Think the world cup has been covered really well by ITV (few issues but in the main great coverage). Showcases for the game have been the “Tier 2” teams and Japan’s epic win against RSA. Equally the way the fans have behaved (Springbok fans forming a guard of honour for the Japanese fans to get on a train – how different that is to some other sports), referee’s performances have (in the main) been great. Another classic from Nigel about diving. The test now for the success of the RWC will be an increase in players and volunteers at grassroots clubs. It has to be that. The profit has been made, the elite team is out so this has to be the “legacy” and that will only happen if the remaining games continue to be supported, well covered and throw up some classic moments. Andrew, I think I expressed similar sentiments in a letter published in last weeks Ely Standard! Great letter Max. I really should get up to Ely sometime this season.